Contact our replacement window service Concord NC experts to start the process of upgrading your home today! We can be reached by phone at (704) 879-3390, or you can fill out the form on this page for a FREE quote. Read on to learn more about the types of windows we can install on your home. If there is a particular style you’re looking for, and you don’t see it on this list, give us a call at (704) 879-3390 to discuss your options! We are happy to work with you to provide the solution you need. These beautiful window style really works to open up a room inside your home, while adding to your property’s exterior curb appeal. 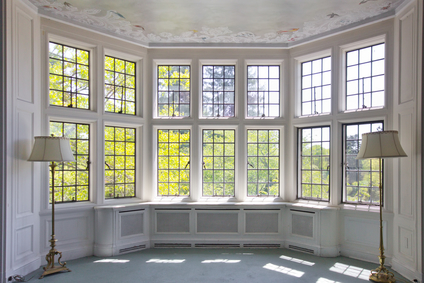 Bay and bow windows become the focal point of an area, adding to its natural aesthetic quality. You may see them a lot in living and dining rooms, because they are so warm and inviting. These large windows are known for letting in lots of outdoor light and will add a feeling of luxury and relaxation to to any space. Our bay and bow window replacement solutions are perfect for anyone looking for an energy-efficient option. Casement windows attach to a frame by one or more hinges and can be angled or opened outward, contributing to your home’s natural ventilation and saving you money on heating and cooling. If you’re someone who likes to enjoy the natural cool breezes during fall and spring, casement windows may be ideal for you. Our window replacement specialists can install them on both home and office buildings in Concord NC and surrounding areas. Double hung windows are a popular choice for homes today. Both the top and bottom sashes move and tilt to make cleaning them easy. This is a great low-maintenance option for residents and homeowners in Charlotte and Concord NC who are looking for an easy, aesthetically-pleasing, energy efficient windows installation option. You can choose from different sizes to suit the layout of your rooms. Our window replacement technicians can help you determine the right look and feel for your space! These are a wonderful option for a sunroom or commercial building! Garden windows let in an enormous amount of natural light. Set your sun-loving plants nearby and watch them blossom as though they were basking in the rays outside. Garden windows installation must be handled with great care, as these are delicate structures and require a competent technician’s hands. Our residential and commercial window replacement experts are licensed and insured home remodeling contractors with decades of experience in windows installation techniques. Similar to double hung windows that are turned horizontally, slider windows slide back and forth from left to right making them even easier to open and clean than their vertical counterparts. They offer energy efficiency and ease of maintenance, making them a popular option for both residential and commercial buildings. Contact our windows installation crew to learn more about slider window replacement for your home or office. Give us a call at (704) 879-3390 or fill out the form on this page for a FREE estimate on window replacement and installation in Concord NC. We work directly with homeowners insurance providers to ensure a seamless and hassle-free experience for all parties involved! Are you finding it difficult to control your home’s heating and cooling system? If you’ve noticed your energy bills are through the roof, despite your efforts to control your energy use, you may be long overdue for replacement windows. Our window installation and replacement services are the best in Concord! Window replacement should be handled by competent technicians, and our contractors are the best in the business, boasting many years of experience serving homes and office buildings throughout the Carolinas. Whether you need a broken window replaced, or you’re looking to save on your home’s energy costs with an entirely new set of replacement windows, we can help! ​Charlotte weather is often unpredictable, causing homeowners to adjust their thermostats more frequently than if outdoor temperatures were somewhat stable. This can result in unnecessarily burdening your HVAC system. With decades of expertise under our belt, we can safely and confidently say that replacing the current windows on your home with more energy efficient windows can definitely help. Our clients have saved upwards of $100 a month on their energy bills following a window replacement. If you’re looking for the best window replacement company in Concord, look no further! Give us a call today at (704) 879-3390, or fill out the form on this page to discuss your options for new windows installation. We are happy to come out to your property and give you a FREE in-person consultation and estimate. If you’re not sure what types of windows will best suit your home, our windows installation experts will give you an overview of all the options and help you determine the right solution for your needs and budget. We also work directly with homeowners insurance providers to make the process of window replacement as seamless and as hassle-free as possible for you. Replacing your windows should not be a stressful process. On the other hand, it should alleviate your stress by finally giving you the assurance that your home will be energy-efficient and cost effective long-term. Let our Concord NC window replacement technicians remove any stress by handling the entire process from start to finish. You simply communicate your desires and let us know what kind of budget you’re working with, and we’ll do our best to give you what you need without breaking the bank! Get started by filling out the form on this page, or click the button below to call our office and speak to one of our windows installation experts today!